The launch is upon us! 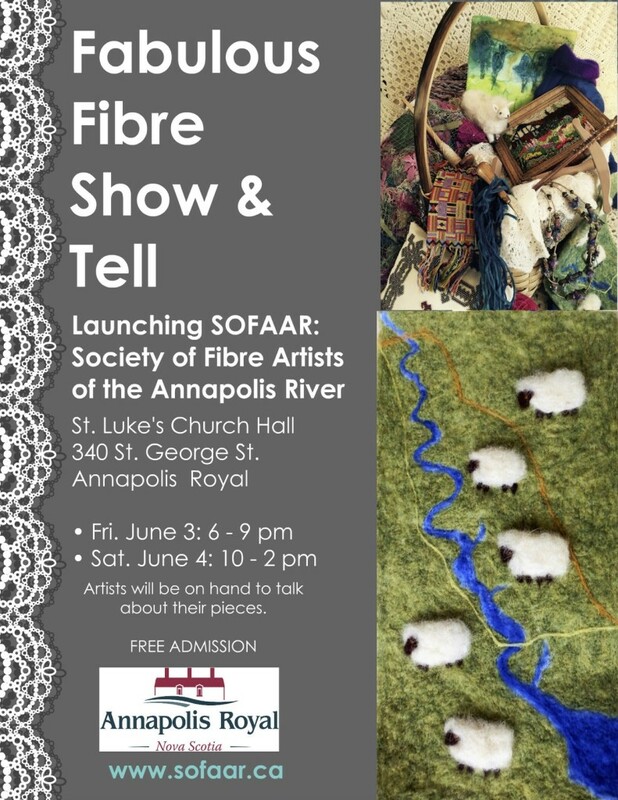 Many participating members of SOFAAR will be speaking about their pieces at the exhibit. Here is the list and times of those speaking. Our posters are being made this week and we are excited to move forward with our launch exhibit this June 3rd and 4th. 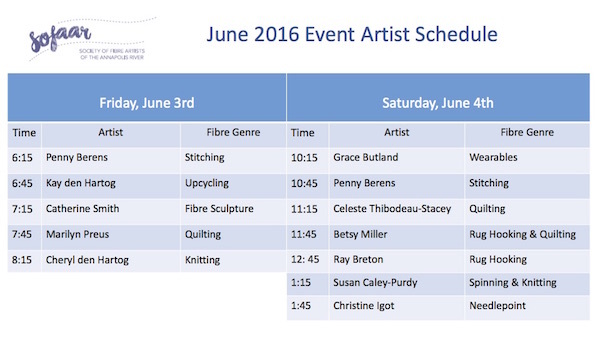 Join Susan Caley-Purdy on the 2nd and 4th Fridays each month (calendar permitting) for all things “fibery” from spinning to stitching. Drop in anytime from 2 to 5 pm. to work on whatever project you have on the go and to see what Susan is up to. 62 School Street, Annapolis Royal. Call Susan at 902-532-0274 for more information. The Rustic Crafters is a group of enthusiastic hookers, knitters and stitchers who meet every Friday in Weymouth at the common room of the public library. Several SOFAAR members also belong to the this busy group. They have just finished, under the guidance of Lorraine Lovett, a hooking hit and miss rug challenge of circles. The idea is to use the basic template – in this case circles – and do an original rug. The exhibit of 20 rugs is on display during the month of May 2016 at Moose River Hooking Studio in Clementsport.